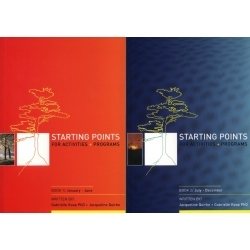 Extra special 1/2 price discount - 100’s of activities are included in this must have set of books. If you are working in the area of activity provision then this set is a must. Starting Points for Activities and Programs - Starting Points are practical and inspirational books for all those working in the leisure, recreation and health fields. The books contains daily program and activity suggestions suitable for a wide range of people including activity co-ordinators and facilitators, diversional therapists, carers, volunteers and family members. Program ideas and activities can be adapted to appeal to a diversity of client groups, ability levels and ages. Activity and program ideas cover areas such as creativity, spirituality, reminiscence, word games and puzzles, quizzes, gardening, cooking and craft, community based activities, humour, physical activity and exercise, special days and themes. April 6: Use the colours of the rainbow to relax and re-energise. October 18: Poem of the day, Fact of the day, Quote of the day, Word of the day, Prediction of the day.